The Monk Michael of Mount Athos painted this three-quarter figure in 1991. 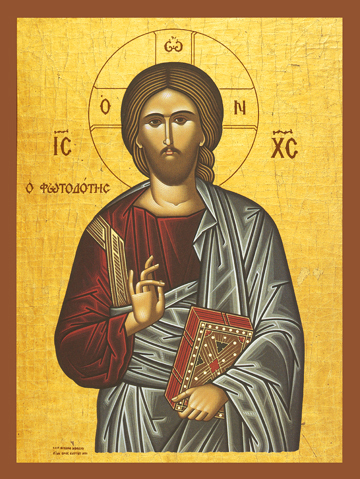 We see Christ standing, carrying an ornamented book of the Holy Gospels in His left hand and blessing with his right hand, making the Sign of the Cross as an Orthodox priest normally makes over the Faithful. His fingers are formed into the shape of the Greek letters “IC XC” which is an abbreviation for the words Jesus Christ. These same letters, with a sign above them indicating that they are abbreviations, are set on either side of His halo or nimbus. Around His head a cross is inscribed in this nimbus for even in His Glory He retained the imprint of His wounds in His hands, feet, and side as a continuing witness to His Love for us in dying on the Cross. In this cross are the Greek letters for “I AM” to remind us that He was before Abraham, even before the time when light and darkness were created, and will now be with us until the light of the Glory of the Second Coming of God. Christ is our Saviour and Redeemer, “Light of light, true God of true God.” May He be the light by which we see all things!